One of Singapore’s top blogger with 30k followers on Facebook. Follow her plastic surgery adventure and read about how she recuperated at Big John’s Place here ! Melissa has established herself over the years as a travel and beauty guru. Click here to find out how she spent her holiday at Big John’s Place. If there is only one site you HAVE to follow, it have got to be ABC-Korea’s. Read about their times at Big John’s Place. Up and coming blogger with a backing of 284k Instagram followers and a love for all things Korean. Read her review about Big John’s Place here. Check out Audrey’s vlog about her time at Big John’s Place ! It was such a joy having her with us ! If you are a regular Singapore drama watcher, you might recognise Shine ! Read about her Seoul adventure here. Taiwanese travel blogger with close to 200k fans behind her. After her success of her first book, she stayed with us while preparing for her second. Check out her detailed review about us ! Sharon is from Taiwan and used to study in Korea. Now, she went on to travelling the world. Click here to read her review ! An awesome guest that dropped us a review after her visit ~ Click here to read what she thinks about us. Japan’s top blogger mostly on Korea and especially on beauty. Read about the times she stayed with us here and here. 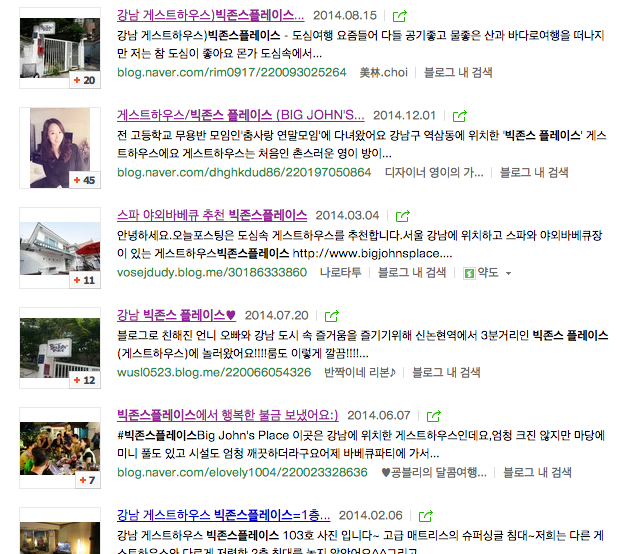 If you want to find out what is it like as a Japanese to live in Korea, Korea Yu’s blog is the way to go. Check out her time at Big John’s Place here. We are extremely thankful for the home like feeling we got during our stay at Big John’s place in Seoul S Korea in Feb 2015. The stylish bunglow, its awesome location in the inn town of Gangnam yet reasonable rates, the super clean and very classy interiors, the cute cosy kitchen and the freedom to cook and yum breakfast spreads, the personal touch to the travel plans , helping us out with local names- thankyou for everything!! You guys rock!! John, his fiancee, his mom ( my dear aunty) and his super helpful brother Jay!! They will make your life in Seoul really easy!! I loved the wooden swing and sauna outside!! I strongly recommend travelers and tourists to stay here and by the end of your trip you will leave a home in Seoul 🙂 Thanks again for all the love. The place is simply wonderful in all aspects, great location, clean, the host John and staffs are kind and helpful, they always have smile on their faces and went out of their ways to help us with directions and ordering food for us. The kitchen has every thing and we really took advantage of it, sorry John. It is beyond expectation. No rowdy youngsters, no dirty linens, spotless washrooms, kitchen loaded with food and drinks! The exterior of the house is painted white, a romantic ambience for many who loves Korean drama :). Greeted by friendly / smilely host – John whom has made many of his guests feel at home. Thank you, John. Even though I have only stayed in the house for 1 day, i love this place .would definitely stay when visiting Seoul again – hopefully this time with a small group of friends/family. For more reviews , please visit our Tripadvisor Page. The best place you could stay in in Seoul. John and his wife are just so fun and perfect to help you and make you feel comfortable. The place is so fine and welcoming. The location is perfect, in the center of gangnam… I recommend urgently this place to have fun !! Hi John and Sunyeong! Thank you for your great hospitality, we definitely had enjoyed ourselves and we will be back! Hope to see you guys soon!! We really enjoyed our time with you and Sun. Thank you so much for your hospitality! Staying at your place was great and so much fun!!! For more reviews , please visit our facebook page. My stay at Big Johns Place was very comfortable and relaxing from the very minute I met the owners. They are very friendly and polite. The rooms, kitchen, living room is very well kept and extremely clean. Everything about the place is very appealing. I honestly can not think of a thing that I did not like. I would recommend Big Johns Place to anybody wanting to stay in this area. If Disneyland is the happiest place on earth, Big John’s place is the most incredible to stay on earth. There’s such a huge spread of breakfast cereals, coffee, fruits and cake for breakfast and all this are done with their own heart. John and Sun are amazing couple that cares for you really well and john speaks perfect English therefore he really pulls us into the Korea culture easily by translating and explaining cultures and recommend places to visit. What’s more amazing is the spacious toilet on the 2nd floor, a chill out area and a balcony overseeing the gangnam city. As his house is situated on a small hill, the scenery is pretty nice out on the balcony. Not only that, it’s much quieter too! This is my 2nd time staying here and he deserve a great testimonial. I believe a lot of people staying there will agree with me too. For more reviews , please visit our Agoda page. For more reviews , please visit our Booking.com page. I stayed only a night at Big John’s, but will def be back again here. The location is great, just a few mins walk away from Sinnonhyeon subway station and trendy cafés/eateries. John and sun were great hosts! John was trying to help as much as he can with my many questions and explaining how to count in korean! The place is kept clean, the beds were comfy and fresh, the atmosphere in the house/garden is very charming and breakfast is made for the guests too! A very lovely bed & breakfast experience I would recommend to anyone who would like some interaction with the host/other guest, but at the same time have their own privacy. These two put real effort in making your stay pleasant. I stayed at Big John’s place for 5 nights on my way to Shanghai. Right away I had a good impression from his place. The rooms were very clean and the beds were incredibly comfortable (something he believes to be very important). The area was perfect for me, down a quiet street in a busy area = great access & good sleep. I spent a good amount of time hanging out on the picnic table talking with him and can not fully express how great of a host he was. For more reviews , please visit our Airbnb page.